Villa Saengootsa is a two-storey vacation residence that exemplifies ultra-modern Asian minimalism. Glassy spaces – with a constant white and bleached wood color scheme – are appointed with mostly in-vogue fixtures, disrupted by either bold-colored or big art pieces and equipped with five-star conveniences to enhance delight and fun. Built on the side of a cliff ascending from Kamala Beach, Villa Sangootsa creates for you modern vacation living with a sophisticated appeal. About half of the villa’s ground floor is devoted to the air-conditioned master bedroom which has an ensuite bathroom with an exterior bathtub. Adjoining the TV lounge is one air-conditioned guest room. The other half of the villa’s ground floor is devoted to three more air-conditioned guest rooms. All guest rooms have ensuite bathrooms. All five bedrooms are attached to appointed terraces with fabulous sea views. 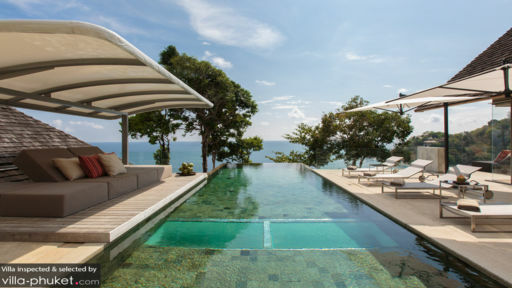 Extending toward the Andaman Sea – on the property’s second floor – is the 15-meter infinity pool. On one side, you can lie and get a tan. 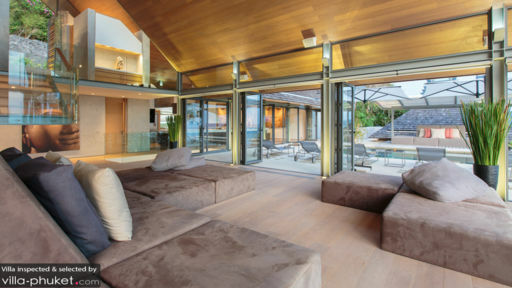 On the other side is a contemporized sala where you can retreat to as soon as the rays begin to burn. Flooded with natural light by day and dramatically lit by night is the second-floor common space. At angles are the spacious living area, the indoor dining area which is integrated to the fully equipped, ultra-modern kitchen with a long counter that doubles as the dinner table providing seating on both sides, as well as the villa’s study which opens out to the alfresco dining area under a pergola. The ground floor common space has a bar, a billiards table and a wall-mounted, widescreen TV. The villa’s amicable staff will attend to basic and additional services that will make every bit of your holiday A-okay. 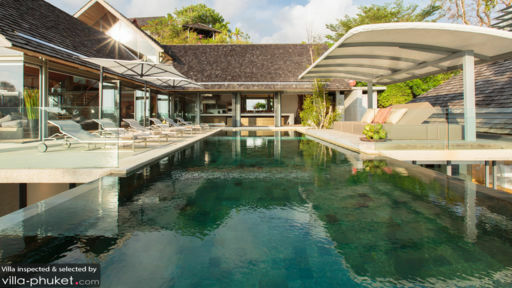 Villa Sangootsa is located within Kamala Beach. At the coastline’s northern end, you can swim, snorkel or even surf. But mind, however, the color of the flag that’s up. During evenings outside the villa, allow yourself to feast on a buffet dinner. Then later on, allow your eyes to feast on an extravagant cultural performance.